1. 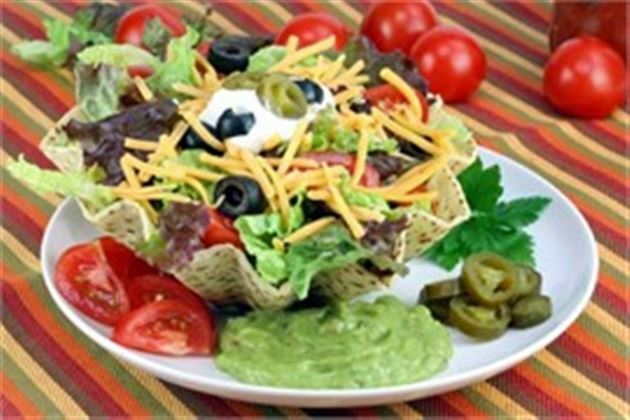 Using a microwave safe bowl or roasting rack, tuck in a flour tortilla. Brush with olive oil. Wad up a waxed paper piece and tuck in the center to help the tortilla keep its shape. Microwave on high 3-4 minutes, or until shell is crispy and starting to brown. Or if you prefer, you may use ready to eat Taco Shells instead. Remove to a plate and pile on the goodies, ending with salsa and lettuce. Enjoy this delicious taco shell salad Mexican recipe!